The Hastings catchment is on the New South Wales (NSW) mid north coast. The catchment area of 4,484 square kilometres extends from the New England tablelands to the Pacific Ocean, encompassing 84 kilometres of coastline. Port Macquarie, at the mouth of the Hastings River, is the catchment's most populous town. Other major towns include Laurieton and Wauchope. There are two major rivers in the catchment: the Hastings, which rises in the Great Dividing Range and flows south-east through a coastal floodplain to Port Macquarie, where it meets the Pacific Ocean; and the Camden Haven, which flows through coastal lakes to the sea. Major tributaries include the Doyles, Ellenborough and Thone Rivers. 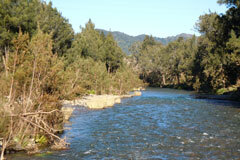 View real-time data from the Hastings catchment on this website. Due to the high density of rural settlement, the region's rivers and estuaries tend to be affected by changed run-off conditions caused by land clearing, agricultural use, human settlement and recreation. Most of the rivers and creeks in the Hastings River Basin are unregulated, without major storages to capture and control flows. Most water users rely on natural flows or small structures, such as weirs for their water supplies. As in most unregulated rivers, flows are most affected during relatively dry times, when water levels are low and demand high. Large areas of state forest and national park occur in the catchment's steep upper reaches, as well as on the coast. Significant habitats with endangered ecological communities are to be found in Port Macquarie, the largest urban centre. Major threats to the environmental integrity of this area include vegetation and habitat loss, environmental weed incursion, feral animals and acid sulphate soils on the coastal plain. Water quality and stream bank stability are major issues.